End of June / Start of July I played Sound Guy / Grip / Actor on the Ellis - Cosho production of The Highly Contested Election for Payette County Sheriff. Came home and had to go into "filmmaking decompression" - something about being on location for 5 days that is annoying as hell: just enough time to get used to working on a film, just enough time to get to know everyone, just enough time to ... well, yeah. And then it ends and we have to come back to reality. So... twelve-hour days and I can't wait to go back and do it again. But not so fast, not so fast. At the beginning of the year when I came down with type II diabetes, I made it a priority to start getting all my accumulated projects completed. 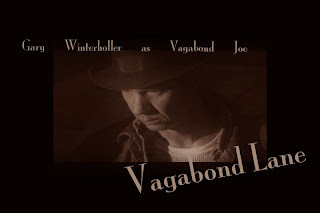 That started with A Season For Brooding (soon to be playing at festival(s) near you), and has now moved onto Vagabond Lane - and in that order because we started Season... six months prior to VL. "Will... come edit. COOOOMMMMEEE EEEEEEEDDDIIIIIIIIIIIIITTTTT!" About that time I ran into Josie at the Flicks and she asked me about VL; I told her it was coming along one frame at a time. Unbeknownst to her, she gave me some great advice, something along the lines of, "hey, man, it's your project, it's your movie - do it your way." So I took about ten months off from the damn thing. Let it percolate, let it simmer in the box (so to speak), and gave myself some perspective on the whole thing. It's a whole new edit now, and a whole new movie as far as I'm concerned. Sure, the story's the same, but I'm back to "playing" - instead of digging in the dirt for a damn wooble. About 1/4 done - and I mean "locked"-type done, I expect to be finished in about three-to-four weeks.